When film was the gigabytes | Cheap Camera, Priceless Memories. Remember those days when you must pray every time you rewound a film after taking your last shot? Because after those sweat so you can have photos with an outdoors background, an exposed roll most likely means a ruined adventure, even for only the last 5 pictures. 36 shots then in mountaineering is like using MB of memory today, which is not enough considering even the cheapest digicam (like mine) now can record video. You must have at least an extra roll, waterproofed. And when you’re changing film during daylight, you must take your backpack cover and convert it to changing bag. Social media is now the arena for your climb pictures. You can even post it online while trekking, assuming your smart phone or laptop has signal. Saving your digital images over the internet gives you a sort of back-up. I once brought a JVC cassette camcorder at Mt. 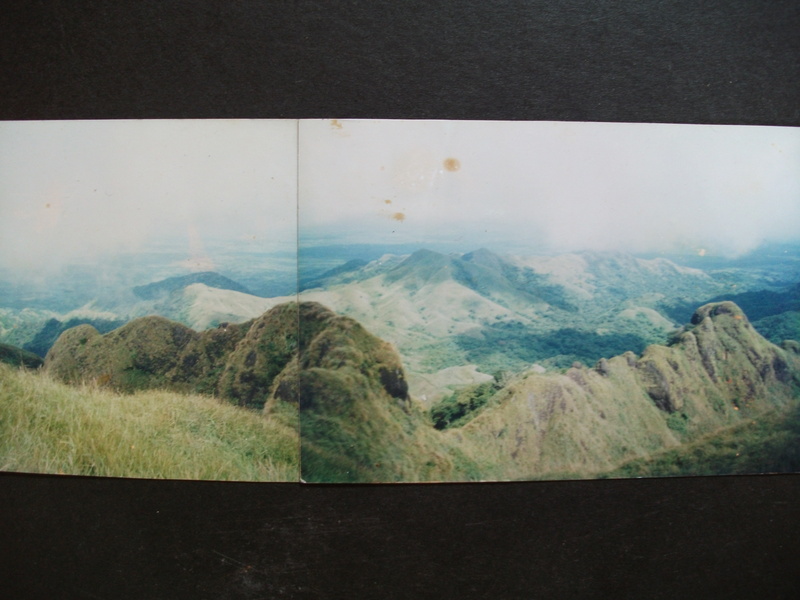 Banahaw on 2002, took some really beautiful videos at Tatlong Tangke and Durungawan (summit). Had I digitized the tape and upload it in YouTube, I could have saved the memories of that Banahaw climb from Ondoy’s flooding of Luzon, September 2009. I managed to save a few prints. Pictures below would have been better scanned, but one boring day last year, I used my digicam to reminisced the great times when all of us friends were singles (hahahaha! ), when mountaineering was the apple of the eyes, when film was the ‘gigabytes’. I could have scanned these at work, but it felt good when I took digital photos of my photograph collections. It was more personal I guess. God taught me humility at Mt. Banahaw, Palm Sunday of 2002, our first climb that had rained. After the Tatlong Tangke, I chanced upon mountaineering icon Sir Long Henson. I broke away from our group and decided to trail him to test my stamina (with due respect to sir Henson, he wasn’t aware of it, he even doesn’t know me). With bad karma, I came to have a slight-hypothermia along the trail, and became the last man from our group to reached the summit. Overconfidence is not a virtue of a mountaineer. Mostly fresh-graduates and jobless then, our group can’t afford to do a Mt. Pulag, the so-called ‘poor man’s Pulag’ Mt. Tapulao became the alternative. Delete the ‘poor man’s Pulag’ for it’s discriminatory, Mt. Tapulao has its own beauty. Another photo stitching, the ‘Rockies’ of Mt. Maculot, the birthplace of our group, un-SEC-registered “Samahang Manglalakbay sa Bundok” or SMB of Brgy. San Miguel, Pasig City. A decade had passed since our group’s last climb, I have one recent climb with my best friend Jun last year. An unexpected tree planting on my friend’s return climb (an unexpected twin hike too). Looking at the picture below, taken from Mt. Daguldol, I wish that we are still in the era of film, when my friends still climb. I know someday we will all be together again, filling today’s ‘gigabytes’ maximum capacity. i like that smile icon, you real bloggers are “real” person, big thanks! this is awesome classic post. I like the way you presented your photos. natuwa ako sa mga stitched pics. nakakamiss ang film.. nung umusbong kasi yung hilig ko sa pag-pipicture (I was a highschool student) medyo patapos na ang era ng films. hay. buti po at nakapag-post ulit kayo 🙂 keep blogging your very nice insights. Ivan, I am so proud of you, Gideon found a new mountaineering artery in you! God bless sa outdoors. Seems like I am way late than expected … In any case, it’s still better to be late than never, isn’t it? I am actually in the middle of my hibernation from writing and I am trying hard to get back into letting WordPress feel my feet stomping the yard. However, this is still not in perfect time I guess. I never thought working overseas will bottle my wandering feet’s lust and tame my blabbermouth until I can find the witch who cast the spells. Off to your blog post now. I really like the idea of reminiscence in it, especially that you somehow managed to successfully weave it into this memory card “thing”. I could just feel the old days shrinking with all its inconveniences as far as the subject is concerned. Forget the imperfection of the photos as what really matters were and are the experiences that came with them, respectively — the intangible ones. This is what certainly makes the pictures exquisite. By the way, the irony of your blog post’s tile is, without a single doubt, epigrammatic. Kudos to that!